Recently I decided for vague and uncertain reasons to start painting some space dwarf figures. 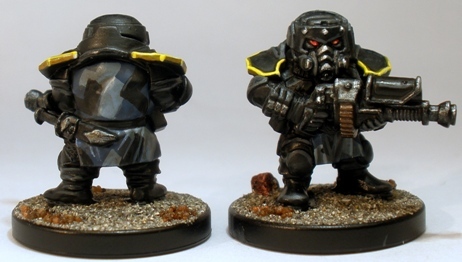 These Forgefathers were the first little guys off the painting conveyor belt. It had to be very quick to paint. I find it important to minimise the number of places that can cause a project to stall and an overcomplicated colour scheme is a big trip hazard for me. I wanted the colour scheme to stand out a little bit on the table: there is no point in painting up a gaming piece that doesnt have enough contrast to make it pop some bit at least. That said, gaudiness isnt really desirable either. Colours used had to reflect a sci-fi rather than fantasy setting: while these guys are undeniably science fantasy, I didnt want my space dwarfs to look like Gimli holding a gun all the same. Therefore I wanted no earthy tones in the uniform. I also wanted to avoid using a lot of metallics. 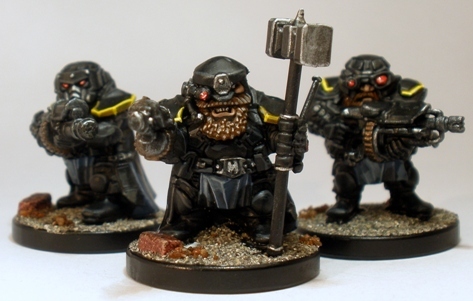 Many painters seem compelled to use multiple metallics on sci-fi dwarf figures, which suggests fantasy more than I want. Half of the figures shown have capes. As far as I was concerned it was crucial that these obvious fantasy elements were toned down a bit. I checked out a few photos of camouflage cloaks in various online places, often those used on sniper and scout miniatures. 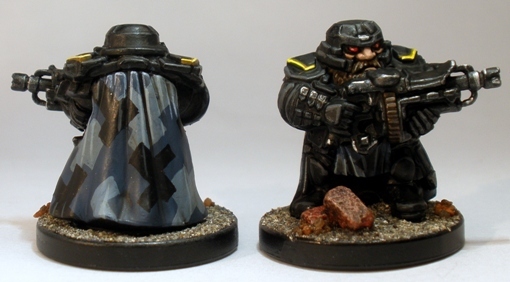 I figured that with these being interstellar rather than subterranean dwarfs that painting the capes to look like they might have a function on a sci-fi battlefield was the way to go. With that in mind I did a tiny bit of research into urban camouflage and I came up with the colour choice and pattern shown on the figures above. I dont know the first thing about real camouflage, but the above effect was reasonably fast to apply and looks believable enough for my purposes. The blues in the cloaks contrast nicely with the yellow shoulder trim. The pseudo-urban camouflage pattern definitely doesnt suggest fantasy to me, so I am happy enough about the look overall. I am interested in what any of you folk think about it. The figures were sprayed black and then drybrushed dark grey all over. The weapons were then quickly drybrushed gunmetal while the magazine/ammunition was painted in copper/bronze. Flesh, ochre (for the yellow) and red areas were blocked in. The capes and tabbards were painted in a dark blue-grey, followed by roughly geometric areas blocked in in a mid-grey, followed by more areas added in black. The whole of each model was then washed with GW Devlan Mud. Every colour used was then given a quick highlight/layer in an appropriate colour. That was these guys finished bar varnishing and basing. Comparison shot next to one of my Sin Eater Chaos Space Marines. The Ursa Miners are short little guys. Pretty quick stuff overall really but a decent enough result. 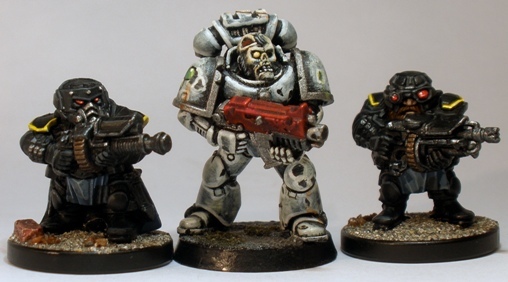 The figures themselves are a little old school looking, reminiscent as they are of GW kits from decade or so ago, but as filler grunts for gaming with they paint up fast and give a pretty decent result I reckon. After painting up a lot of delicate, finely detailed Wyrd miniatures recently it was pleasant and productive working on a durable set of chunky, fun little guys to plonk on the table. If I could change anything about the end product it would be to find a way to add some of the blue-ish camouflage to the front face of the miniatures, which are possibly a bit too drab. Curiously, these guys are possibly the only miniatures that I have ever painted that are more interesting to view from the rear (insert joke of your choice here). More Ursa Miners will be showing up here soon. They look ace, I feel a horrible urge to buy some now. Will you be using them in 40K or Warpath? Although I still have an interest in the 40K background and miniatures It has been nearly a decade since I played 40k with any sort of regularity, so the Ursa Miners may never be used in a “proper” game of WH40K. As sixth edition seems likely to be quite a big shake up, I might get around to using them in a game or two of that…maybe. I do have plans to play some skirmish scale 40K games soon using Inquisitor retinues. I want to have a variety of small forces to use as allies and enemies in these games. The Ursa Miners are one of these forces (although they are turning into a far larger project than I had originally planned). I do know a local Warpath player so once I have the enough Miners painted I plan to give that system a go at least once. As for the horrible urge to buy some Forgefathers at least they are cheap. The plastics work out at ~£1 each and a lot less than that if you buy a starter set or battleforce equivalent. I’m posting a link to this project on my blog, would it be all right if I crop one of your pictures to use next to the link? No problem Gavin and thanks for asking. There should be another Ursa Miner post up early tomorrow too. I look forward to it, would love to see a group shot when you’ve finished the lot of them as well! Are you going to picking up Space Dwarves from other manufacturers as well?